As it relates to a child who is having some difficulty socially, emotionally, and/or behaviorally this process is crucial. When we have meetings or discussions about how best to support a child with any number of issues the child should be present. For part of, if not the whole meeting. For younger children, it may be that they are brought into the meeting so what the adults have discussed can be explained. If they are not present for the whole meeting it is still important to give them time to reflect and ask questions. Also, if the child is particularly bold, they may make suggestions. So be prepared to listen and discuss. Be careful not to shut down the child’s suggestions or questions. Do not pass them off as being immature or not up to par with the discussion. Engage in thoughtful and meaningful conversations with the child. With older children, they should be present throughout the whole meeting. I love including older children, say 12+ in these meetings. I find that not only does it foster self esteem like we’ve been saying all along. But it also helps to keep the adults on task and speaking about the child in a way that is strengths based. Having the person you are talking about in the room forces us to think about how they are receiving the information. It keeps us on track with what the actual goals are. Also, it serves to empower the child because the goals are a reflection of their struggles, and not just the struggles of others who also may be effected. All in all, shared decision making helps self esteem because decisions are being made with the child rather than being imposed on the child. They are empowered to take control of their lives. Building Maturity is a lifelong process for most people. What is maturity anyway? 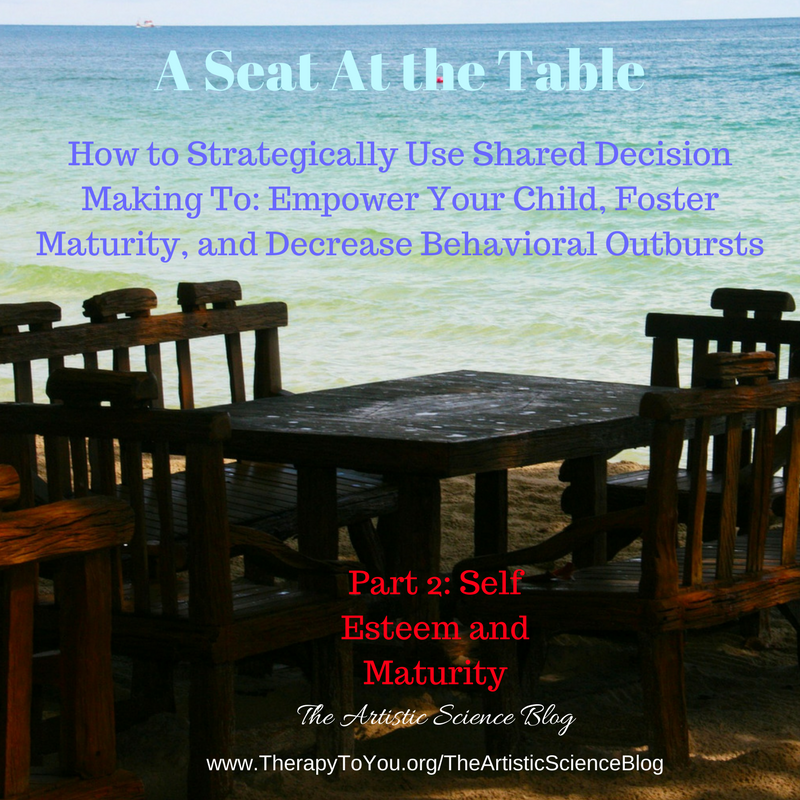 When your child is sitting at the table it conveys to them a sense of responsibility. Undoubtedly one of the key features of maturity is being able to be responsible. Also, to take responsibility for one’s actions. So, making a plan to address a child’s challenges and barriers not only empowers them, it allows them to feel a sense of responsibility for ensuring that the plan works for them. Furthermore, it causes them to hear some of the logic that the adults around them use to make decisions. Hearing the different connections that adults make, and how they reason will help them to develop those skills themselves. Aren’t convinced that self esteem and maturity are enough reasons why giving your child a seat at the table is important yet? Stay tuned for next week when we talk about self efficacy and accountability! Hello! I just wish to offer you a huge thumbs up for the great information you have right here on this post. I’ll be returning to your website for more soon.